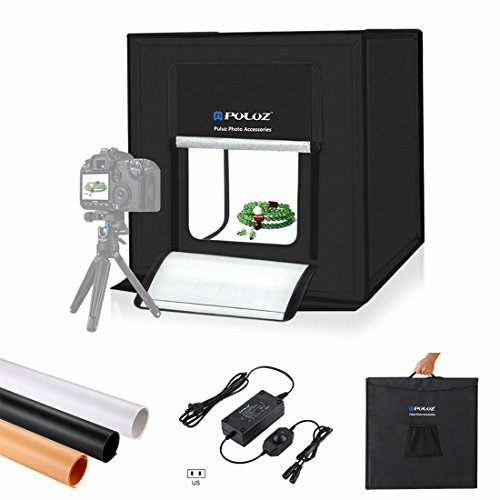 This PULUZ Photography Studio Tent utilizes reflective side panels to instead of using diffusion on the sides of the box. It not only prevents light from escaping the box, but also helps to keep the light balanced and diffused. Its detachable, foldable and portable performance changes the concept of traditional studio opens up a new possibility of photography. This Light Box enables everyone to take awesome, studio-quality pictures with a simple setup such as a smartphone. We have designed three different sizes to totally meet your different shooting demands. Without worrying about taking high quality pictures for your online shop products anymore if you have this soft box. Attention: The tripod and the camera showing in the picture are not included. PULUZ is specialized in products development and sales for all kinds of accessories for GoPro, DSLR Cameras and Camcorders. 【Super Bright & Adjustable】 Two integrated lighting bars, 2*30 PCS high-quality SMD LED beads, 30W 2400LM; In addition, the brightness can be adjusted. 【Multi-angle Shooting】 Equipping with a front horizontal shooting window and a vertical window, it can meet different shooting demands. 【Easy to Install】 All the installation can be finished with only velcro, five steps, without complicated installation process. 【Profesional】 This studio box can not only provide an uniform illumination, but also eliminate shadows and reflections; More importantly, there is no strobe. 【Portable】 Without any heavy metal support frame, it's much lighter; The unique fold-storage design makes it easy to carry.